Click on an underlined name in the list below to read the citation that accompanied that person’s E.M. Hasluck Award presentation. Please note that citations prior to 1992 are currently unavailable. Whatever the role he takes on, Keith gives 110 percent of his effort. In the roles of Chairman or President, he ensures that all tasks are assigned and people understand what is required of them and the relevant timeframes. He is never reluctant to offer words of encouragement when needed and praise when earned. Keith leads by example; he has never been known to avoid the less glamorous tasks such as washing the dishes or cleaning the floor. His very positive attitude makes new club members and visitors feel welcome and has almost certainly helped to increase raffle ticket sales at the twice yearly Mandurah fairs. Keith is in the process of rewriting of the WAPC Constitution to meet with current legislation. From 2005 to 2009, Keith was actively involved behind the scenes assisting with the WAPC Youth Development Programme. Keith has given many hours of his time to help members and non-members sort through inherited collections and deceased estates. Since 2010, Keith has co-hosted the twice-yearly Mandurah Stamp, Coin & Banknote Fair, coordinating his and Mandurah Philatelic Society’s efforts with those of the other host, Peel Region Numismatic Group. As President of the WAPC he has arranged visits and talked at Kalamunda, Vic Park and Armadale clubs. He has also exhibited at country clubs in Bridgetown, Eaton, Busselton and Albany. He formed a sub-committee to liaise with former and potential members of the defunct Albany stamp club in an effort to revive that club; the Albany 2014 Fair was part of that effort. His drive and tenure have seen a new enthusiasm for club membership drives. He has written to all WA clubs as President of WAPC with ideas to increase the club membership. His efforts have resulted in many WA clubs seeing an increase in membership numbers and participation levels. The Hasluck Trust is pleased to announce that the E.M. Hasluck Medal has been awarded to Mike Kouwen. Mike has held administrative positions in clubs and societies variously since the early 1980s. His extensive service to the Fremantle and Districts Philatelic Society was recognised with Life Membership in 2010. His helpful assistance to the WA Philatelic Council’s ‘Home for Philately’ at East Perth, as a member of the WAPC Committee, is acknowledged. He has contributed research on a range of topics to Black Swan, Stamp News, The Cinderella Stamp Club of Australasia Journal, and the WA Card Collectors’ Society Journal. Australian customs duty stamps are a major interest and he has received awards in national exhibitions, most recently in Hong Kong this year. He is a strong advocate of local stamp shows supporting our hobby. This includes both the organising and participating as a part-time stamp dealer. We congratulate Mike as a worthy recipient of the Hasluck Medal for 2016. John is in his fourth term as President of the Philatelic Society of Rockingham and Kwinana Districts. He is actively involved in the club committee and has contributed significantly to the success of club functions and projects over many years. John has compiled and displayed collections with an emphasis on FRAMA labels and orchid stamps at Club and State level since 1987. John is a strong advocate of club activities and providing guidance and encouragement to members young and old to further their enjoyment of the hobby. He is a worthy recipient of the Hasluck Medal. Trevor has been involved in promoting philatelic activity for many years. He became a Committee member of the Philatelic Society in 1983. From that time he has served as Secretary, Vice-President and President, in addition to being the club Auctioneer. He was Convenor of the yearly Stamp Mart between 1987 and 2006 and continues to operate a successful fund raising programme for the club. He also joined the Stirling Philatelic Society in 1988 and helped to promote the hobby in that area. His studies of WA Barred Numerals and Australian King George Fifth ‘Penny Reds’ have been successfully exhibited at National level. He is always ready to share his knowledge and has contributed articles to the Cover Collector Journal. In the past Trevor has promoted Juniors, which has included being Stamp Club Convenor at Duncraig Primary School and organising the PSWA annual Junior competition. Trevor’s continuing involvement in a variety of areas has contributed much to our hobby and is recognised by this Award. Bruce started collecting stamps in 1949 and since then has made major contributions to organised stamp collecting in this state and elsewhere in Australia. He is always keen to participate in club, society and community activity by displaying material from his varied collecting interests. Bruce has been active in mentoring Juniors and Novices in addition to debating vigorously with more advanced collectors! He has exhibited competitively with success at major exhibitions both in Australia and overseas. Bruce was chairperson of the WAPEX 1993 Organising Committee and has served on the jury at SWANPEX and SOUTHPEX variously since 1993. At the moment he is chairperson of the Jury for this Swan River Stamp Show. He served as Convenor of several specialist societies and has undertaken a broad range of research topics resulting in publication of his findings for the benefit of all philatelists. The Philatelic Society of Western Australia awarded him the Frank Hedges Trophy in 1994 and the Barnes Research Cup in 1998. We offer our congratulations to Bruce for his extensive involvement with the hobby over many years. Glen’s contributions to philately in Western Australia and nationally are extensive in the areas of administration and exhibiting at all levels. He become involved with the WA Philatelic Council as a Committee member in 2001 and since then has held the positions of President, Vice President, Secretary and Public Relations Officer. He is an active member of the Mandurah Philatelic Society and has served as President, Treasurer, Secretary and Librarian. From 2003 he has been the editor of the Peel Philatelist and has also written articles for a variety of other journals. Glen was the primary organiser of the recent National Stamp and Coin Show in Mandurah that proved a great success. Glen has exhibited at state, national and international levels over the past ten years, including aspects of British New Guinea and Papua, Nicaragua, Singapore and Western Australia and now Siam. He has also supported the hobby at the national level as Treasurer of the Australian Philatelic Federation from 2007. Presented on Sunday 10 October by Justice Nicholas Hasluck during the Swan River Stamp Show 2010. Bernard Buckland commenced his involvement in the hobby of stamp collecting when he formed the Northampton Stamp Club in the early 1980s and became a long-standing member of the Philatelic Society of Western Australia. After moving to Perth in the late 1990s he joined the Philatelic Society of Rockingham and Kwinana Districts where he served two terms as President and was editor of the society’s magazine The Ship Letter for several years. He has won several club trophies and State awards and been active in the Rockingham area promoting the hobby. As a member of the WA Philatelic Council for several years, Bernard has assisted in the revision of its Constitution and at present is the Public Relations Officer. A great asset is his promotion of the hobby to the public by radio, displays at various locations, and travelling to country centres, which has resulted in clubs being formed at Busselton, Eaton, and Bridgetown with more on the list in the south-west. Bernard’s ability to meet people and attract them to the hobby outside the club scene has resulted in greater interest throughout Western Australia. Presented on Sunday 4 October by Ms Hasluck (granddaughter of E.M. Hasluck) during the Swan River Stamp Show 2009. Jeff was a founding member of the Eastern Goldfields Stamp Club in 1996 and is currently its President. He is a member of nine other local societies and clubs and has held offices in several of them. 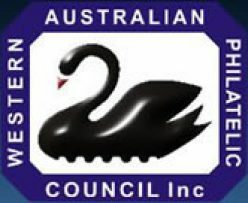 He has served on the WAPC Executive Committee since 2003 and been active in the WAPC Youth Development Programme and the organisation and running of the Swan River Stamp Shows. He is always willing to assist in the critical setting up tasks at the shows. Jeff continues to make a major contribution by designing and hosting web sites for a number of stamp clubs and societies. Jeff has a particular collecting interest in WA Forgeries and Picture Post Cards and in the stamps of Latvia. He has exhibited extensively at Club, State and National levels and received a number of prizes and trophies. He participates regularly in displays and club meetings. He is an Apprentice Judge at this Stamp Show and it is my great pleasure to present the Hasluck Medal for 2009 to Jeff Trinidad. Peter joined the Fremantle and Districts Philatelic Society in 1987. He became Secretary in 1993 and Vice-President the following year. He is currently on the committee and edits the club’s Fremantle Mail journal. In 1990, Peter joined the Philatelic Society of Rockingham and Kwinana Districts and was Secretary in 1997-1998 and edited their journal Ship Letter for six years. He was President for two periods: 1999-2001 and 2003-2004. He has been Rockingham’s representative on the W.A. Philatelic Council for nine years and is currently a member of the executive and is the Council Library Officer. He served as Publications Relations Officer for five years and produced the monthly Events for your Diary. During that time he arranged promotional displays at several country towns and throughout the metropolitan area. Peter was the WAPC representative on the Seniors Recreation Council. He gained the Frank Hedges Award in 2007 for his lengthy service to the Philatelic Society of W.A. and its Daytime Stamp Club. He is also an active member of the Stirling Philatelic Society. Peter has been on the State Swan River Stamp Show Committees for the past eight years including this year. He was Souvenir Manager for three State and one National Exhibition. He has exhibited extensively at Club, State and National levels. He participates regularly in displays at the club meetings and is always willing to help when asked. Peter has now been actively encouraging philatelic development in Western Australia for more than twenty years. Long may he continue! Presented on Sunday 21 October by Justice Nicholas Hasluck during the Swan River Stamp Show 2007. Brian Whittaker’s involvement in philately in Western Australia commenced in 1970 as Treasurer of the Philatelic Society of Western Australia, a position he held for five years. Since then he has been Vice President for seven years and a Committee member for thirteen years. He is a member of the WA Study Group and was Treasurer for eight years. He has served as Floor Manager at various exhibitions held in Perth. Brian was the author of a monograph on WA Slogan Postmarks and is continuing research on this subject as well as taxed letter markings. He has contributed articles to the BLACK SWAN and various overseas journals. He has an extensive record displaying and giving talks about his various collections at some sixteen clubs in this State over a period of thirty five years. He has been awarded medals at State and National Exhibitions. Brian Whittaker has made a significant contribution in all aspects to our hobby of philately in Western Australia. Presented on Sunday 22 October by Justice Nicholas Hasluck during the Swan River Stamp Show 2006. Brian Austin is a long-time member of several stamp clubs and societies, both here and overseas. Throughout this involvement, he has actively promoted the hobby through club and public displays, newspaper columns, radio and TV presentations and ‘behind the scenes’ work for Juniors and Seniors. He edited and produced the Postmark Newsletter throughout its eleven year existence and has, over the past twenty years, served as an office-bearer in both the Postmark Club (now known as the Postmark Circle), and the Stirling Philatelic Society. He is currently their Secretary and Treasurer, respectively. Brian has had a lengthy involvement with the WA Philatelic Council, initially as a Committee member and then as Public Relations Officer. He has been Auditor since 1994. He is active in the exhibiting area both as an Accredited State Level Judge, and as a member of organising committees. He was Bin Room Manager for the 2004 National Swan River Stamp Show, and Chairman of the Organising Committee for NORTHPEX 96. He is, in fact, Chairman of the Jury for this Stamp Show. Brian has broad collecting interests, with a particular affection for British India and postmarks of Western Australia. He has entered innovative displays competitively, winning the Stirling Trophy four times and also exhibited at state and national events. Brian Austin has made significant contributions to our hobby as both club member and administrator. Presented on Sunday 16 October by Justice Nicholas Hasluck during the Swan River Stamp Show 2005. Jan Gane is a member of some seventeen local and international clubs and societies and has displayed at many of their meetings and contributed to their publications. She has always shown a willingness to be involved in club administration, particularly at the Stirling Philatelic Society and the WA Philatelic Council. At Stirling, she joined the Committee in 1994 and was elected Vice President from 1997 to 2000 and President from 2000 to 2003. She then became Librarian and revived the Stirling Newsletter, which had been in abeyance for some years. Jan joined the WA Philatelic Council as Stirling’s delegate in 1996 and was a member of the Executive from 1998 to 2001, during which time she was also Public Relations Officer and interim Secretary. She was elected Vice President in 1998 and then President in 2001 and served a three year term. She has actively promoted stamp collecting and the activities of the Council by establishing the innovative Events for your Diary and setting up an electronic data base of Junior Collectors, amongst other initiatives. Jan was Chairperson of SWANPEX from 1999 to 2002 and was responsible for introducing P-Stamp souvenirs as an effective fund-raiser. She served on the Organising Committee for 2004 Swan River Stamp Show and has lately played an active part in establishing the “Home for Philately” at Wellington Fair. Further afield, Jan represented Western Australia as the delegate to the Australian Philatelic Federation for several years in addition to holding other positions with that organisation. As well as this very public philatelic life, she has compiled major collections of Seychelles and Israel, with particular interest in the modern period. She has exhibited at state, national and international level and was appointed Western Australia’s 20th State judge in 2004. Jan is showing no signs at all of slowing down. Presented during the Swan River Stamp Show 2004. Penny Wells has been a very active member of the philatelic fraternity over many years. From 1982 she has been on the Philatelic Society of Western Australia committee, which has included the positions of Vice President and President from 1985 to 1989. She is now Vice President again from 2003. Penny has been a committee member of the Stirling Philatelic Society for the past eight years. An asset in these areas has been never hesitating to do the basic chores at club meetings. Assistance with Juniors has continued over the years. Her other activities have extended to four National Stamp Exhibition committees when held in Perth. On the exhibiting scene, Penny has displayed two major collections of New Zealand, achieving high medal levels at state, national and international shows. Two years ago, she achieved the position of a State Judge. Operating as Hyde Park Stamps, Penny has been able to support collectors with many items for their collections at various Stamp Fairs. In summary, Penny has provided outstanding service to philately in this State continuously for 25 years. Harold Clay has been the stalwart of philately outside the metropolitan area. In 1977 he was a founder member and inaugural President of the Mandurah Philatelic Society. His commitment to the hobby has meant that he has held all committee positions at various times over 25 years. In Mandurah he organised regular workshops to assist adults and school children with development of the hobby. Further promotion involved the use of the local media and holding children’s competitions with the assistance of Australia Post. A highlight in 1979 was his organisation of a stamp show outside the metropolitan area over a weekend at the Mandurah Senior High School. A move to Dunsborough in 1981 resulted in him forming a new club where he was elected as President and also conducted the exchange circuit. On returning to the Rockingham / Mandurah area in 1987 he rejuvenated the Mandurah Philatelic Society that had been in recess and again was elected President. It has now a strong membership base. Harold is now a Life Member of that Society and is in the process of documenting the Club’s history. Presented on 12 October by Ross Duberal, Chairman of the Hasluck Medal Trustees, during SWANPEX 2002. Richard Vickers has made a long-standing contribution to philately in Western Australia. From 1978, he has been directly involved with the development and administration of the Kalamunda Stamp Club. Being President for fifteen years and also serving continuously as the Club Circuit Sheet Secretary has resulted in club members aptly describing him as “the backbone of the club”. At State level, he held positions on the WA Philatelic Council as Public Relations Officer and then Secretary over a period of five years. He was a Trustee then Chairman of the E.M. Hasluck Trust for five years. Involvement with organisation of the annual Souther Stamp Show, otherwise known as STAMPEX, occurred regularly since its inauguration eighteen years ago. Promotion of the hobby direct to the public occurred for fourteen months in the mid 1980s with the production of a fortnightly radio programme with the late Mavis Deathe. Richard has provided stamp displays and been guest speaker at various clubs and supported Junior programmes in his district. In summary, Richard has provided outstanding service to philately in this State continuously for twenty four years. John DiBiase’ contribution to philately in Western Australia has been extensive in the areas of administration and exhibiting. His activities in administration involve being a committee member of the Philatelic Society of Western Australia for the past eleven years and convenor of the Western Australia Study Group for three years. He has been the Philatelic Liaison Officer with the Western Australian Philatelic Council since 1999, which involves providing guest displays and talks at clubs. He has recently been elected Vice President of the WAPC. As floor manager and frames officer he has greatly supported several State and National Exhibitions held in the last eight years. He has contributed articles to several philatelic publications and conducted personal research on various subjects. John has exhibited at State, National and International levels in the past ten years including six different exhibits involving Western Australia. His other main interest is the Great Britain Penny Black Plates. Recently he has achieved the status of a National Judge after his judging at club, State and National shows doing his apprenticeship. John has actively promoted the hobby throughout the Western Australian clubs though his extensive involvements. Presented on 22 October by Nicholas Hasluck QC during SWANPEX 2000. Bob Radley’s major contribution to philately in Western Australia has been an extensive involvement in philatelic administration. At club level, he has been a member of the committee of Canning Stamp Club for the past fifteen years, and President since 1994. He was awarded Honorary Life Membership of that club in 1999. He has also been a committee member of the Philatelic Society of Western Australia since 1987, and Vice President for the past four years. Bob’s involvement at State level commenced in 1986 when he joined the Executive Committee of the WA Philatelic Council. He became Vice President in 1996, and President in 1999. He held the important position of Exhibition Chairman for SWANPEX in 1995 and 1996, and was on the organising committee in 1998. He is also a State delegate to the Australian Philatelic Federation. Bob has exhibited at State, National and International levels variously since 1983. Over the years he has provided articles for a variety of journals and has been guest speaker at numerous club meetings. He has judged many club competitions and was appointed a State Judge in 1995. Bob has actively promoted the hobby whenever an opportunity presented itself. Most importantly, he has always been willing to undertake humble tasks such as manning the Information Table at the numerous Stamp Fairs and State Exhibitions. Presented on 24 October by Nicholas Hasluck QC during SWANPEX 99. Graham Berry’s major contributions to philately in Western Australia have been his extensive involvement in philatelic administration and his ‘down to earth’ approach to the hobby. At the club level, he has been a Committee member of the Stirling Philatelic Society since 1980 and was President from 1985 to 1991. Graham’s involvement at the State level commenced in 1985 when he joined the Executive Committee of the WA Philatelic Council. He became Vice President in 1990 and was President from 1992 to 1995. For the past four years he has been Treasurer and is currently a member of the Junior Development Committee. He has represented the Council and Western Australia at several Annual General Meetings of the Australian Philatelic Federation. Graham recognises that the hobby has great benefits for the community at large and has actively promoted it at numerous public exhibitions and Stamp Fairs. Equally importantly, Graham has been actively involved in the maintenance of Display Frames and other property of the WAPC over many years and has been ready to lend a hand with all sorts of jobs. Presented on 25 October by Nicholas Hasluck QC during Stamp Show 1998. David Wood’s contribution to philately has revolved around the development of the hobby in the Rockingham area and, more generally, at the State level. He was the founding Vice President of the Philatelic Society of Rockingham and Kwinana Districts in 1986 and subsequently became President. For the past five years he has been the Public Relations Officer and the Editor of the Society’s quarterly journal the SHIP LETTER . David has been broadcasting weekly to the Rockingham area on SOUND FM for the past four years. He has displayed his fine collections of Antarctica and Great Britain at various clubs, stamp shows and shopping centre promotions. At the State level, he has been an Executive Member of the WA Philatelic Council for several years and currently holds the position of Country Club Circuit Book Secretary. He continuing support at the Council’s information table during stamp fairs and exhibitions has been exceptional. Ross Wood’s contributions to philately are well illustrated by his impressive list of administrative positions. He was a founding member of the Karrinyup Philatelic Society and a committee member between 1977 and 1981. He has held various positions on the committee of the Philatelic Society of Western Australia over the last twenty years including President, Circuit Supervisor and is the current Secretary. Ross has edited and produced the society’s official newsletter, Stamp Hinges, since 1984. He was made a Life Member in 1996. Ross became a delegate to the Western Australian Philatelic Council in 1989 and was elected Vice-President in 1993 and he is the current President. In addition he has edited and produced the Western Stampgroper for the Council since 1995. Ross has assisted with the organisation of various State Stamp Shows including auctions and their catalogues since 1984. He has displayed a number of his own collections at clubs and at State level and he is noted for his willingness to assist in promoting all aspects of our hobby. Presented on Sunday 27 October by Nicholas Hasluck QC during Stamp Show 1996. Eddie’s contributions to philately have been many and varied. His involvement began in 1947 as a junior member of the Philatelic Society of Western Australia and has ranged from club administration, club displays and talks, through to competing at national exhibitions. His administrative positions include three years as Secretary of the Swan Stamp Club in the 1970s and a number of years as Committee Member of the Philatelic Society of Rockingham and Kwinana Districts, where he is currently Vice President. He has also assisted in various capacities at stamp shows in this State. Eddie has exhibited competitively and achieved medals at Club, State and National levels with his major interest of Australian postal stationery. He is also well known for his extensive collection titled Visiting Ships to Western Australia. He has contributed to such publications as Ship Letter, Fremantle Mail, Stamp Hinges, Postmark Newsletter, Western Stampgroper and the Australian Exhibitor. Eddie’s aim over the years has been to bring friendship into the hobby by corresponding around the world, showing his stamps and supporting others to do as well, and to promote stamp collecting as a hobby for Juniors. Peter Stewart has been involved in organisational activity for the benefit of stamp collectors at all levels. He has, for example, been Treasurer, Vice-President and President of the Stirling Philatelic Society at various times over many years. He has also filled these positions for the Western Australian Philatelic Association or Council. Most importantly, he has been prepared to take on time-consuming positions such as Secretary, Circuit Secretary and Frames Officer. The Council has recognised his valuable contribution by conferring upon him the honour of Life Membership. Peter has served on organising committees for major philatelic exhibitions held in Western Australia over the last fifteen years or so and has helped raise considerable sums of money for both CUPPEX and WAPEX through the Stirling Exhibition Account. He has been an active participant in the running of exhibitions and has the happy knack of being able to produce calm and thoughtful solutions to difficult problems when the pressure is on. He has encouraged exhibiting at club and local level in the best possible manner by entering his own material. It is not widely known that Peter has printed many circuit sheets free of charge, for the Association and Council, the Stirling Philatelic Society and the Wanneroo Stamp Club. Peter Stewart has embraced a broad view of philatelic activity well beyond the immediate interests of his own clubs and has recognised the importance of helping individuals and other clubs to participate in our hobby. His vision has had practical outcomes in many different forms and always to the benefit of philately as a whole. Geoff’s involvement in stamp collecting began more than forty years ago when he joined the Eastern Goldfields Philatelic Society as a Junior in 1951. He has been a member of the Philatelic Society of Western Australia almost continuously since 1954. Service to the hobby commenced with that Society where he served as Treasurer and Librarian at various times. Since then he has filled many positions on other bodies. A foundation member of the Stirling Philatelic Society, he has served as it Secretary since inception in 1976. Geoff also became a foundation member of the Postmark Club in 1985 and has been its Treasurer since then. Geoff in the past has been a delegate to the WA Philatelic Council and its predecessors, the Western Australian Stamp Promotion Council, and the Western Australian Philatelic Association, and served for years as Treasurer of those organisations. Apart from the onerous duties of those particular offices, he has been a hard worker in the organisation and staging of many displays, exhibitions and events at both Club and State levels. Geoff Elliot is a great workhorse and ‘quiet achiever’ in promoting and facilitating philately at the grass roots level. Much of his work is behind the scenes and unglamorous, carrying out the tasks that no one else seems to want to do. His contributions to the wellbeing and life of our hobby have been large and the Trustees are very pleased to be able to recognise them. Presented by Nicholas Hasluck QC during WAPEX ’93. Dorrit Hunt has spent much of her life in Albany and she has been a major factor in the development of stamp collecting and philately in the Great Southern Region. In 1957, her efforts to establish a stamp club in the town came to fruition with the formation of the Albany and Districts Philatelic Society, of which she was foundation Secretary. She remained in that vital position for the next five years. Although the Society ceased operating in 1962, Dorrit Hunt continued to promote the hobby in a very positive way, which started in 1958 as a weekly broadcast for children on the local commercial radio station 6VA. That program developed into one for adults as well as children and as the ‘Stamp Lady’, Dorrit Hunt broadcast on a weekly basis for some twenty-five years. Anyone who has produced a weekly newspaper column or a regular radio show will recognise this as an extraordinary achievement. Dorrit Hunt recognised the importance of community activity as a complement to her radio work; stamp designing and other competitions for Juniors were held on a regular basis in Albany. She organised and judged a Junior Stamp Section at the annual Albany Show for many years. She encouraged and assisted youth organisations such as the Scouts, Guides and Brownies in the promotion of the hobby amongst their members and was always willing to supervise and assist with stamp collecting projects. There can be no doubt that Dorrit Hunt has contributed a great deal to the hobby under circumstances of relative isolation, limited population, and a lack of supporting facilities. That she was able to maintain a viable stamp collecting presence in Albany for a quarter century is a tribute to her dedication and enthusiasm for the hobby. Presented by Nicholas Hasluck QC during SWANPEX 92. Mr Thomas’ contributions to philately are many and varied. His involvement has ranged from community displays, club administration and exhibition entries to high-level research and literature. Throughout, he has generally given of his time and shared his accumulated knowledge and expertise. Official positions held by Phil have included Librarian and President of the Fremantle Philatelic Society. During his presidency, the Society was awarded the Stamp News ‘Most Active Society’ award for the whole of Australia. He is also a foundation member and President 1990-92 of the Postmark Club of WA. Mr Thomas has exhibited competitively and won medals at State and National exhibitions for his collections and has provided many displays at stamp clubs, post offices and other venues. Phil has contributed much to such publications as Western Australia: The Stamps and Postal History and the forthcoming Postal Markings Illustrated. He is co-author of Western Australia: The Postal Stationery to 1914 and has had articles published in a number of philatelic journals throughout Australia. His contribution to the recording of WA Postal History is immense and invaluable. The foregoing is but a brief overview of a very active philatelic life. Phil’s high level of achievement marks him as a very worthy recipient of the E.M. Hasluck Award.